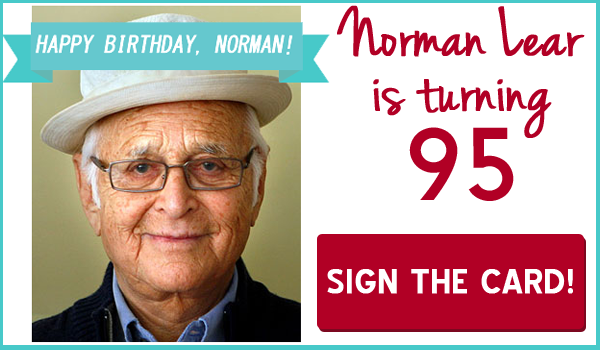 Norman Lear — cofounder of People For the American Way, legendary TV producer, and my friend — turns 95 this week! Norman has been a steadfast and effective champion for progressive values throughout his long and storied career. With shows like All in the Family, Maude, The Jeffersons, Good Times, and many more, Norman raised social consciousness and tackled important issues in changing times that helped shift our culture toward one of greater tolerance and understanding. In the early 1980s, when the rise of reactionary forces on the Far Right threatened to hold back progress and foment hatred and bigotry for political gain, Norman Lear brought together political, faith, and thought leaders to found People For the American Way. More than 18,000 PFAW supporters have already signed our birthday card for Norman. If you haven't already, will you join me and other PFAW supporters in saying "Happy Birthday, Norman!" by signing a card for him now? July 19 was the first official meeting of Donald Trump's 'Electoral Integrity' Commission, a sham panel that he convened to investigate his own fake claims of mass "illegal" voting in 2016 election. The Commission is chaired by Vice President Mike Pence and one of the nation's most notorious vote suppressors, Kansas Secretary of State Kris Kobach. And it features other voter suppression superstars like the Heritage Foundation's Hans von Spakovsky, and former Ohio Secretary of State Ken Blackwell. All of these men have been part of active efforts to suppress voter turnout, pushing for measures that disenfranchise voters of color in particular. Read our report on the Commission to learn more about the players involved and what they're aiming to achieve. Our affiliate PFAW Foundation took out a full-page ad in the New York Times to expose the true agenda of Trump's commission. And PFAW and our allies rallied outside the White House during the swearing in of the Commission to let them know that we will stop at nothing to protect our right to vote. Click below to read more and watch video of PFAW staff speaking out! Support People For the American Way! Trump and his allies are pursuing a dangerously extreme agenda on everything from judges and the separation of church and state to health care and taxes. They created a new commission to trample voting rights and exhibit unprecedented lawlessness as they do more harm every day to our vital democratic institutions. Help us beat back attacks on core constitutional rights and values with a donation today! It's been a rollercoaster month for Republican efforts to repeal the Affordable Care Act in the US Senate. Republicans revived Trumpcare with a shameful party-line vote, which set in motion several days of intense debate over amendments and a version of the bill called "skinny repeal" — which some Republican senators lambasted as a "fraud" before supporting it anyway in a late-night vote. 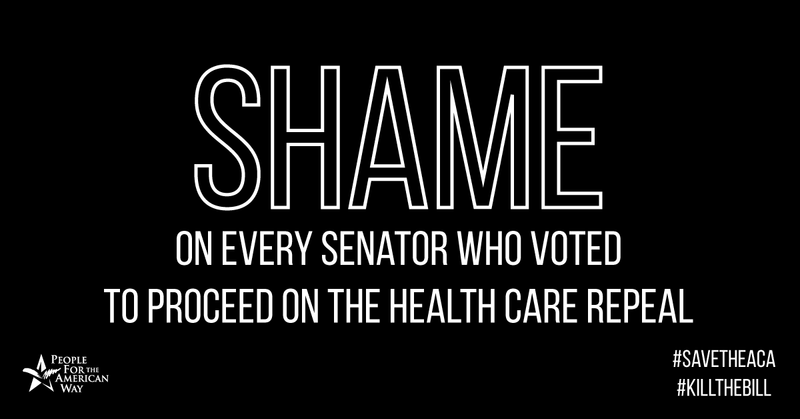 However, "skinny repeal" — which still would have taken health care from 16 million Americans and jacked up premiums across the board –FAILED, with three Republicans (the minimum number needed to stop the bill) voting "no." Amazing activists across the country fought hard to stop this bill, with many even risking arrest in sit-in actions and other acts of civil disobedience. But the fight is still not over — McConnell has indicated that the GOP's assault on health care is far from over. EVERY proposed version of ACA repeal — even the most pared-down, 'moderate' proposal — kicks millions of Americans off of their health care and sends premiums skyrocketing. We have to keep up the drumbeat of resistance, and that includes shaming the politicians who put millions of people's health and lives at risk. Among the list of Trump's right-wing judicial nominees are two that stand out as perhaps the least qualified nominees we've seen so far for the federal bench: John Bush and Damien Schiff. John K. Bush was confirmed on a party line vote for a seat on the Sixth Circuit Court of Appeals, despite his long history of offensive writings rife with racism and misogyny, as well as a confirmation process that further revealed his reckless temperament and lack of qualifications for the job. Bush has compared Roe v. Wade to the Dred Scott decision that upheld slavery and subscribes to legal theories that would put more money in politics, not less — music to Mitch McConnell's ears and, unfortunately, not surprising. In 2014, Bush's wife was on the board of a dark money group called the Kentucky Opportunity Coalition that spent a whopping $7.1 million to help reelect Mitch McConnell in that year's KY Senate race. Trump's other bottom-of-the-barrel nominee who had a hearing this month is Damien K. Schiff — an anti-environment lawyer who also has a past of vitriolic blog posts. Like Bush, Schiff refused to discuss his originalist constitutional interpretation during his hearing. In his time as a lawyer advocating against environmental regulations and groups, he has painted environmentalists with a broad brush and has an openly antagonistic attitude toward them, worrying activists that he would not be neutral as a Federal judge. Further, he has been openly hostile toward the LGBTQ community, and has called promoting diversity in higher education equivalent to the Dred Scott, Plessy v. Ferguson, and Korematsu decisions. Our affiliate PFAW Foundation hosted the annual convening of its Young Elected Officials (YEO) Network this month in San Francisco. In addition to this year's group of dynamic progressive lawmakers and mayors, this year's convening featured an opening plenary with Alicia Garza from the Movement for Black Lives, a lunch plenary with PFAW board member and Gold Star father Khizr Khan, and sessions with many notable progressive activists. And staff and members of PFAW Foundation's Young People For (YP4) program have been working to educate young people about the threat of voter suppression and the Trump's new so-called 'Election Integrity' Commission. They even hosted a Facebook Live panel discussion with PFAW and PFAW Foundation experts — check it out! PFAW joined with 1,500 other groups across the country urging members of Congress to prioritize the needs of people and communities in the federal budget — not the needs of politicians and the wealthy. The budget proposal we support is one that rejects controversial policy riders and promises prosperity for all Americans, including families with children, women, seniors, people with disabilities, communities of color, and others who are increasingly left behind in the current economy and proposed GOP budget. This email was sent to stickbogart@gmail.com. Reaching you over email is the best way we have to let you know about the ways you can take action to fight the Right Wing and defend our constitutional rights and values. If you have any thoughts, comments, or criticisms, or if there’s a better email address at which to reach you, please let us know. If you’d like to unsubscribe from our list, you can do that here. But know that if you leave, it will be harder for you to stay involved with People for the American Way and continue our crucial work. PFAW is able win policy battles and elections, and counters the Right’s extremism and hate, because of dedicated activists like you, and we're always eager to hear your thoughts. Thanks for your support.